Here is information on our exciting eco-tourism development project now in our 8th year. Space is limited, so please book early. This is a perfect family Jewish heritage trip for all generations. Please forward to all interested parties. Our travelers rave that this is one of the best experiences of their lives! Note: Airfare, travel insurance, gratuities, & drinks are not included in either package. Visit with the Abayudaya Jewish community and spend two shabbatot in a rural African village synagogue. Be honored guests at the fabulous Abayudaya Music and Dance Festival. Experience exciting safari adventures, and a wildlife cruise on the (natural Kazinga Channel which connects two lakes – George and Edward). 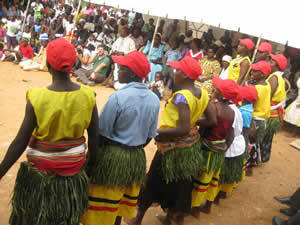 The “Jewish Life in Uganda Mitzvah Tour” is led by experienced Abayudaya tour guides. We travel in air-conditioned vans. Accommodations are in friendly hotels & beautiful safari lodges, featuring hearty meals. and/or be long-term community volunteer. Meet the Abayudaya Jewish Community! Visit the Abayudaya synagogues and the many Kulanu.org supported mitzvah projects. Learn the history of this amazing community and enjoy the hospitality of Ugandan Jewish families. 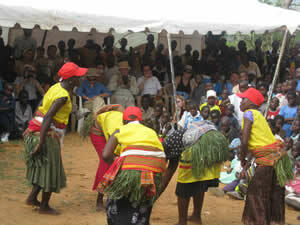 Enjoy an authentic, worldbeat African Jewish Music and Dance Festival, exclusive to this tour. Share Ugandan Jewish culture, history and music through talks, celebrations, concerts, and arts and crafts demonstrations. Learn about the ethnic groups, languages, agriculture, economy, as well as unique flora, birds, and wildlife of Uganda. Volunteer if you wish, sharing skills with the Abayudaya Community. Tour the famous Kulanu- Abayudaya “Delicious Peace” fair trade, interfaith organic coffee project, recently featured in Oprah Magazine. Learn about our other self-help business development and micro-finance projects in remote villages. Thrill to fantastic safari adventures in beautiful Queen Elizabeth National Park. Marvel at the sight of baby hippos, elephants, colobus monkeys, warthogs, antelopes, crocodiles, 612 species of birds, and more, all living freely in the national park. Cruise on a lovely wildlife viewing boat trip on the Kazinga Channel between Uganda’s Great Lakes. See the source of the magnificent Nile in Jinja town. Visit colorful, bargain-filled arts & crafts markets in Jewish villages, in the bustling capital, Kampala, and in Mbale town. Best of all, make a personal connection with our friends in this remarkable African Jewish community! Suggested itinerary. Subject to change. Flights limited! Book now! www.shalomtoursuganda.com Custom group tours available at other times throughout the year. Suggested Itinerary. Subject to Change. Welcome! Pick up at Uganda Airport. Check in and brief orientation. Early breakfast. Long drive through picturesque hillside villages and colorful markets, gorgeous tea and banana plantations, to Mweya safari lodge. Look for baboons on the way. Check-in. PM optional Game Drive to see elephants, hippos, crocs, buffalo, storks, warthogs and more. Early AM Game drive as we transfer to the southern sector of the tree climbing lions, game drive as we check-in or after check-in. Early AM Checkout. With a game drive enroute, today we have higher chances of seeing the Leopard and another chance for the tree climbing lions plus huge migrant elephants from the neighboring Congo. Shabbat service, family visits, meet the community! PM Torah study. Shuttles to hotel. 10:30 AM Tour High School Headmaster Seth Jonadav. 2 PM Visit Namonyoni synagogue. 3 PM Coffee Tour: Meet “Delicious Peace” Director JJ Keki in Nangolo. Tour new “Delicious Peace” Kulanu USAID construction project. Lunch in Busembatia or Nasenyi. Visit with Abayudaya members, including youth and Abayudaya Women’s Association in Namutumba and Nasenyi. Visit beautiful Mt. Elgon National Park. Volunteer in Abayudaya Community if you wish. What to expect on this trip? The Abayudaya Jewish Community welcomes you to their beautiful country! This is adventure travel, perhaps unlike any you have experienced before. This trip is a project to empower sustainable economic development in the Abayudaya Jewish community through eco-tourism. You may be changed forever. You will be inspired by Africa and her people and moved by the survival of Jewish communal life there. Our wildlife safari lodges and national parks have been featured on Animal Planet and BBC documentaries and will thrill your family. If you join us, you must be in good health, flexible and ready to deal with changing circumstances with a sense of humor. You may walk as much or as little as you wish. We are traveling in the dry season. Expect occasionally dusty air quality. Remember to drink constantly and enjoy! Everything has been done to help us be as comfortable as possible, given that we will be traveling by air-conditioned van on dirt roads into agricultural villages, some with no electricity and no running water. Uganda is a developing country. The pace is much slower there. Bring your camera, binoculars and patience. Expect occasional delays. Look up our hotels on the internet. Hotels are friendly, modest and clean, with running water and electricity. TV is occasional. Power outages are frequent. Remember that hotels, meals, and ground tour as outlined are all included. No credit cards. No traveler’s checks. Note: Ugandan banks will only exchange spending money in $50. bills issued after the year 2000. Please leave expensive jewelry at home. Food may be different from what you are accustomed to and is influenced by East Indian cuisine. Vegetarian meals are available. Great fish (tilapia, nile perch) is generally available fresh from Lake Victoria. Kosher Shabbat meals in the Abayudaya community are available. Bring dry protein snacks to keep with you on long road trips. Bring a sense of humor. Bring a willingness to learn from our hosts. Important: Bring spending money in US $50 bills issued after 2000. Uganda will not cash US bills issued earlier than this date. No kidding. No credit cards and no traveler’s checks. Uganda is on the equator. Bring lightweight, easy to rinse out casual summer clothes for adventure travel. Bring a hat. Pack for a very hot climate, with a light jacket for mountainous regions. Wear sneakers or comfortable walking shoes. One checked bag, and leave plenty of room for purchases! African clothing and crafts are beautiful and reasonably priced. One carry on bag including prescription meds, an extra set of clothes, underwear and sundries, in the event of lost baggage.